I had only seen Sur lie as a process on Chard/champagne. Seems this can also be done on some Muscadets, as is this one. Pale to golden in color with a nice mild nose of minerality. On the mid palate the wine matches the nose with lovely rich minerality. There’s no citrus notes to my tastes. On the medium length finish the wine displays nice crisp, dry minerality. The wine has some lovely mouth grip that grows in the mouth. The minerality nicely coats the palate. The wine is super food friendly. While the wine is not watery, I would not consider it overly creamy either. I have no idea how long it was in contact with the lees. I quite enjoyed this wine, muscadet grape is a little new to me, recommend by a colleague, thanks Greg. I bought this particular wine on a flyer with no research. I would give it an 88+. The LCBO say light and crisp which to my tastes is a little under describing the amount of flavor in this wine. The has created by the Chon Family at the beginning of the XXth century. It is mainly defined by the sand the silt composing the ground. The presence of the blue schist in the ground is really suitable to elegant wines. 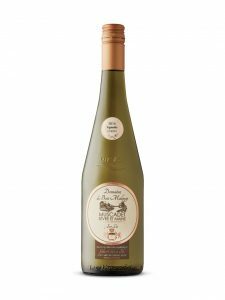 This Muscadet which matured on the lees has a pale golden color and is rich in almond and white citrus aromas. The smell is lasting and gives a great vivacity which is sustained by iodine notes. It finally ends in the mouth on a spicy note, which conforms a rich and balanced fruit along with a nice perlant. This Muscadet sur lie is perfect for seafood and fishes.